This one isn’t so much funny as just plain ole fun! For more Saturday Stumbles, visit Mandi at It’s Come 2 This. 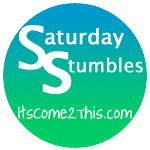 3 Responses to "Saturday Stumbles – The truth about moms, Seinfeld thriller and pancake breakfast"
I’m going to have to check out the “You Know You’re a Parent When…” post! Have an awesome weekend, Sarah!